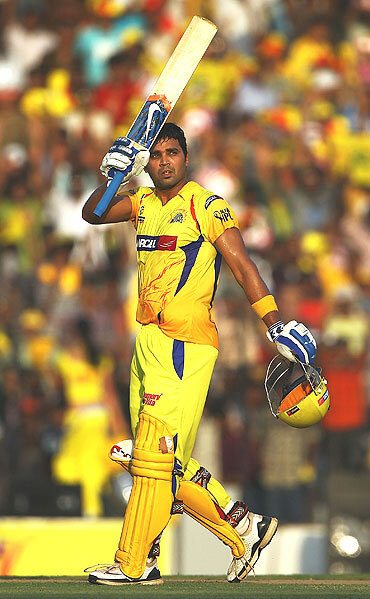 Opener Murali Vijay scored a blistering century to help the Chennai Super Kings beat the Rajasthan Royals by 23 runs at the MA Chidambaram Stadium on Saturday. Vijay and opening partner Matthew Hayden started positively. After seeing off Yousuf Pathan in the first over they went after Sumit Narwal scoring 15 off the second over. Hereafter, both the batsmen went after the ordinary Rajasthan bowling. Hayden treated Shaun Tait and Shane Watson with disdain and hammered them for fourteen runs off two overs. Hayden was in top form and it looked like he was heading for a big knock. However, it was not to be as Hayden once again failed to build on his start. He was dismissed for 34 off 21 deliveries (5x4) in the sixth over off Shrikant Wagh. Hayden's dismissal did not deter Vijay, who looked like a man on a mission. He continued his good form in the tournament and tonked all the bowlers out of the field. Suresh Raina came in at No 3 and got going. He hit two sweet boundaries and looked good for more. 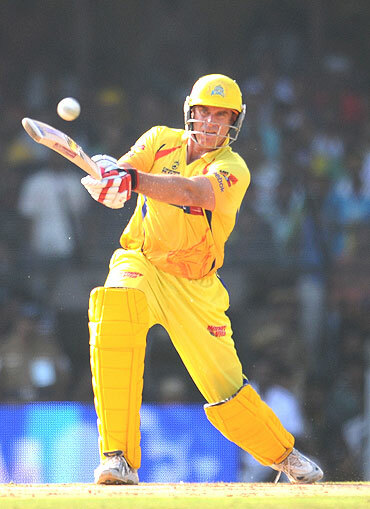 But Shane Warne showed his magic in his opening over and had Raina (13) caught by Tait at point. The Super Kings reduced to 83 for 2 in the ninth over. The tempo of the match was slowed down a bit after the wicket of Raina. The run-rate did dip, but only just as Albie Morkel joined Vijay to maul the Royals bowling. Vijay fired a boundary every over and paid no heed to Warne's reputation as he slapped the Austalian legend for a straight six to reach his second successive half century. The next over, Vijay welcomed Pathan into his second spell with a solid boundary followed by 2 successive sixes. Vijay reached his century off just 46 balls - the fourth fastest in IPL history. 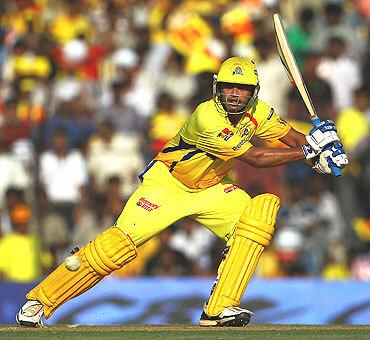 The Chennai opener's eventual effort - 127 - came off just 56 deliveries, was inclusive of eight boundaries and 11 maximums and was a perfect follow-upto his 78 in the previous game against Royal Challengers Bangalore, an effort that had had won him the man-of-the-match award. It was the highest ever score by an Indian in the tournament. It was also only the third occasion that an Indian had made a hundred in the IIPL - after Manish Pandey's unbeaten 114 against Hyderabad in the second edition and Yusuf Pathan's 100 against Mumbai Indians earlier in the tournament. Morkel played a perfect foil, scoring an aggressive 62 (off just 34 balls), a knock that was inclusive of three hits to the fence and five over it. The duo put together a stand of 152 runs for the third wicket - a partnership that came off just 66 balls and was the second highest in IPL history. Vijay was eventually dismissed in the final over by Watson. Vijay and Morkel's aggressive batting meant none of the Rajasthan bowlers had noneworthy performances. Michael Lumb (37) ensured the Rajasthan chase began with the right intent, scoring as many as three boundaries in Morkel's first over. However, Bollinger gave away just a single in his first over to put the pressure back on. There was a lull before the Rajasthan batsmen broke the shackles in the fifth over by Sudeep Tyagi, both Naman Ojha and Lumb helping themselves to a six each as they garned 18 runs. 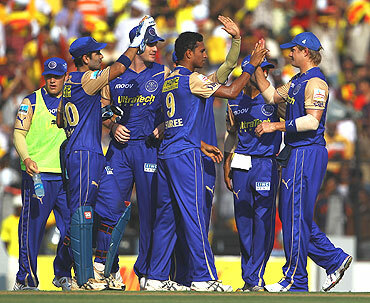 The sixth over by Morkel fetched the visitors another 15 runs, with Ojha helping himself to three boundaries. As the field restrictions eased, Rajasthan had made 62 without loss - Chennai had made 66 for one at that stage. 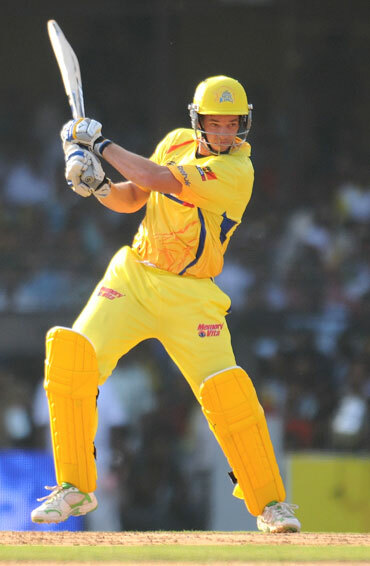 Chennai got the breakthrough in the next over, Morkel having Lumb caught by Aniruddha Srikanth at sweeper-cover. In came Yusuf Pathan (4) and he faced just two balls - announcing his arrival with a boundary before a superb catch by Bollinger brought a premature end to his innings. After Pathan's wicket, Shane Watson, then joined Ojha and the duo added 97 runs for third wicket. They kept the Royals in the game with their aggessive batting. The Royals were cruising until Doug Bollinger bowled Watson in the 16th over to break the partnership and start the downfall of the Rajasthan team. Hereon end, Rajasthan's runrate continued to dip and they kept losing wickets at regular intervals until they came close and lost as they eventually wound up at 223 for five in their stipulated 20 overs. It was the home team's fourth win - their second straight - in nine matches in this edition and was a perfect reply to their 17-run defeat at Motera in the opening encounter between the teams this season. It was also the Chennai team's third win in seven matches against the team from Rajasthan and moved them up to fourth in the table. Doug Bollinger, playing in his first match, was the pick of the Chennai bowlers with impressive figures of two for 15. In fact he was the lone bowler to survive a batting onslaught in the match.